Dammit, Janet! The Blu-ray deal this week at Amazon features a sweet transvestite from T-T-T-Transylvania! 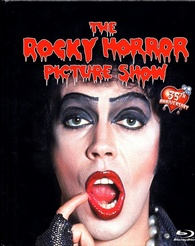 The online retailer has just lowered the price of 'The Rocky Horror Picture Show' starring Susan Sarandon, Barry Bostwick, Meat Loaf, and Tim Curry to $14.99 (57% off suggested price). The Blu-ray digibook release features loads of new material including: Rocky-oke: Sing It! ; Don't Dream It, Be It: The Search for the 35th Anniversary Shadowcast, Part I; An-tic-i-pation: The Search for the 35th Anniversary Shadowcast, Part II; Mick Rock (A Photographer); Mick Rock's Picture Show (A Gallery); Pressbook and Poster Gallery; The Midnight Experience: The Late Night, Double Feature, Picture-in-Picture Show, Vintage Callback Track (Unrated), Prop Box, Trivia Track; and BD-Live. Click here to do the Time Warp and own Jim Sharman's devilishly twisted musical on Blu-ray! This offer is in effect from now through October 29.